Box of 50 Pieces 16' Long. The 5/16" X 1" HD Screen Frame is made of heavier .025 mill thick, roll formed aluminum. It is cambered (slightly bowed) to retain screen tension when installed. See Spline Guide below. 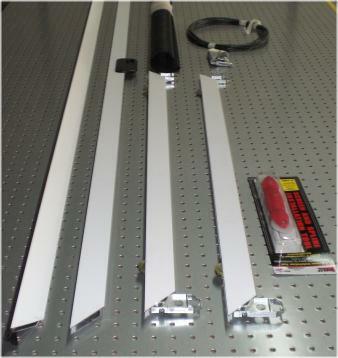 The 5/16 thickness also allows the frame to fit into the tracks on many aluminum windows for a nice integrated look. The 5/16" X 1" HD Screen Frame is strong enough for Solar Screen Material and holds it shape well. Color Select Silver White (+$60.00) Bronze (+$60.00) Tan (+$60.00) Champagne (+$60.00) Show Colors? I"m very pleased with my screen, considering this is the 1st time buying screens online. Everything was in great condition and I would order from you in the future. Disadvantages: Only problem is there were no screws sent with the screen. I would have thought this would be an automatic thing.....I saw the items that you could order with the screens but thought they came with them. It's my fault but now I have to order them. Can you help me with that? Please have someone send me an email so I can order them. Thank you for your help! I was not sure what I needed for my solar screen projects for my house and was glad to be helped by the person who answered the phone at Quality Window Screens. I was advised on all the materials that were needed and got them in about two weeks. I love the look of the Windows now and waiting for my next power bill to see what savings I'll be making on the electric bill. I would have given five stars if some of the frames were not bent when I got them. Disadvantages: Took two weeks for frames to arrive. And some were bent. I made about 50 frames for some apartments, I am a first timer. I was very pleased with the strength, look and outcome. Screens are very strong and fit is excellent. We use Quality Screen products because they ARE quality. We could get cheaper material but "cheaper" is not good. Very pleased with the screens. Well built and the quality appears to be excellent.